MIDLOTHIAN, Va. – In a milestone achievement for renewable energy, Dominion Power announced that Chesterfield County ran entirely off renewable power this weekend during a major power outage caused by the snowstorm. 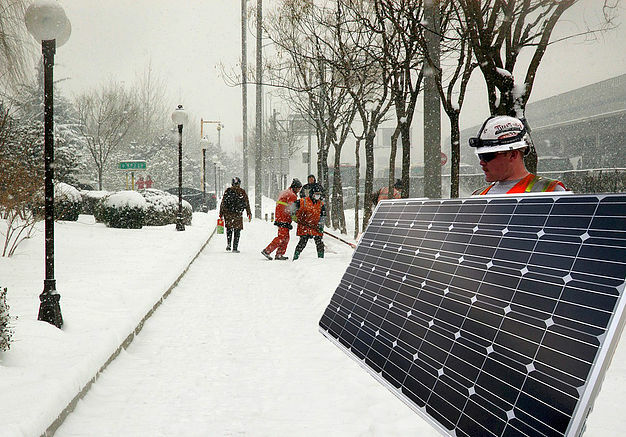 Dominion unveiled the move as their new “Snolar Power Program,” which utilizes solar panels and other tactics to conserve energy during outages. Homes in Midlothian, Bon Air, and Brandermill enjoyed clean, renewable energy in freezing temperatures while power lines were downed by heavy snowfall. “Our house was freezing, our pipes burst, it was awful,” commented Woodlake resident Barry Matthews, “Still it feels great to know our carbon footprint was so low during that time, even if that foot is now frostbitten.” Entire neighborhoods went dark during the lowest temperatures through what environmental groups are hailing as a big step forward for the sustainability movement. “The complete failure of the grid coincided with a dramatic dropoff in energy consumption which can only be attributed to Dominion’s Snolar Power Program, a trusted part of our sustained commitment to renewable energy technology,” stated a Dominion Power press release. The heavily coal-reliant energy company indicated that 5 or 6 more power outages will really help Dominion achieve its green power goal for 2017. While Dominion’s new program is being considered a success, it did not come without consequence from the affected residents. However, many residents are recognizing the potential long term effects worthy of personal sacrifices. As of press time, power had returned to 97% of homes in Chesterfield adding an additional 3 million tons of CO2 to the atmosphere annually.